Ecuadorean cartoonist Bonil (Xavier Bonilla), who cartoons for the Guayaquil-based daily El Universo, has gone on trial for a cartoon published on August 5th, 2014. The cartoon juxtaposes a newly elected celebrity assemblyman’s communication skills with the substantial salary politician’s pull down. President Correa’s antagonism towards the press is well-documented. In 2010, he sued Bonil’s paper over a published column and the paper was slapped with a US$42 million fine. 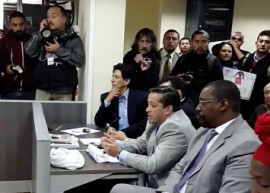 Though the fine was quickly suspended by the Inter-American Commission on Human Rights, the episode was cited by the New York Times as “Rafael Correa’s campaign to silence and bankrupt El Universo, Ecuador’s largest newspaper” and condemned by Reporters Without Borders. A complaint by President Correa over a previous Bonil cartoon led to a $90,000 fine in 2014. Correo’s changes to Ecuador’s media regulations, which an International Press Institute report characterized as ‘threatening press freedom and eroding freedom of expression,’ leave Bonil and his paper facing a possible fine of near US$500,000. El Universo was ordered to publish an apology in the paper where the Bonil’s offending cartoon had appeared, and to post an apology on its homepage for seven consecutive days.